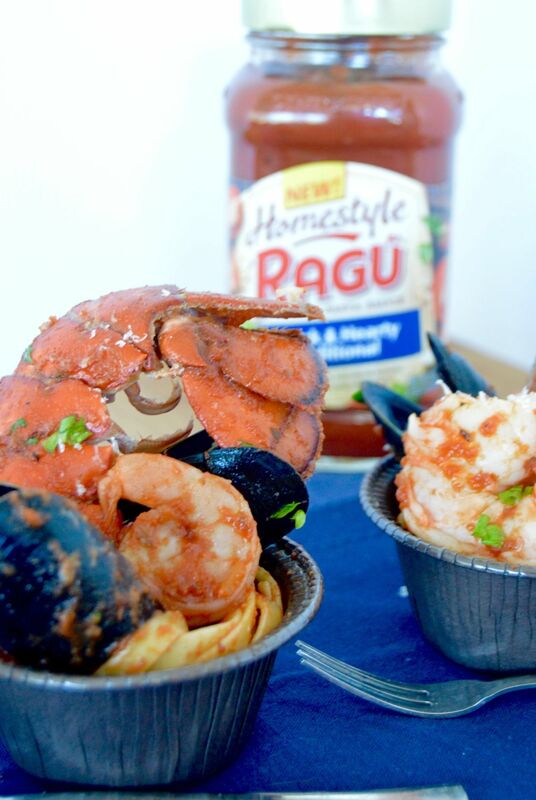 The recipe Im sharing for today for Easy Shellfish Linguini is sponsored by Ragu, but the opinions expressed and memories of simpler times are all my own! Ragu has a new line of sauces that are called Homestyle. There are several flavors available. The beauty of these sauces are they are made with real ingredients ( no artificial colors or flavors here!) The sauce also is nice and thick…. not like most store bought pasta sauces. This sauce coats your pasta beautifully and isn’t watery. When you take a bite, there is plenty of sauce because its nice and thick and grabs on to your ingredients so its packed full of all of the delicious flavors of the pasta sauce. In the recipe I’m sharing with you for Easy Shellfish Linguini, you get a delicious taste of tomatoes, basil and garlic in every bite. When I was growing up my mom always made sure that we all sat down to dinner together. It wasn’t an option; if one of us kids had practice after school, then we all waited to have dinner together. My mom made everything homemade. When I have the time I like to make all our dinners homemade, but in today’s world it isn’t always possible. Enter Ragu Homestyle Pasta Sauce. This sauce is like homemade! I can serve it and feel good about the meal I put on the table for us to eat as a family. It’s the only store-bought sauce I have used that I didn’t feel like I needed to doctor it before serving it. The fact that I can make it in the time it takes to boil the linguini to a perfect al dente texture makes it a winner in book anyway. You know I like to entertain, so I don’t want to just serve linguini and sauce? 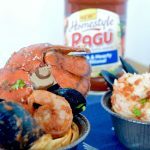 This recipe for Easy Shellfish Linguini uses all of my favorite shellfish, then tosses them with the linguini and Ragu Sauce. Even if it’s a last minute get together I can steam the shellfish in the time it takes to boil the pasta and have it ready to serve in less than 30 minutes! By putting them in the smaller containers for serving they are portable to have in hand while visiting out on the deck in these nice summer nights! 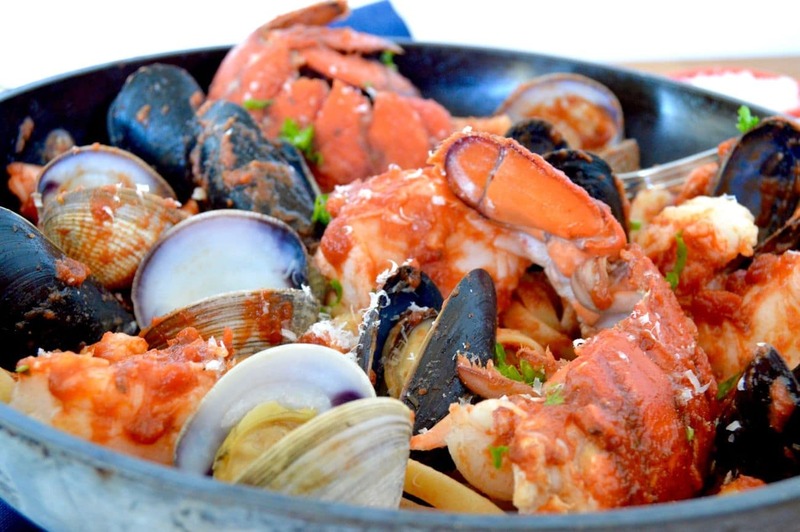 My guests love that they get a few bites of really fresh shellfish but are able to be completely satisfied by having them served over sauce laden pasta! This recipe for Easy Shellfish Linguini is perfect to serve when you're crazy busy but still want to impress those you're cooking for! This can be served in less than 30 minutes! Into a stock pot, add water required as suggested by linguini box. While pasta is cooking, in a small saute pan add wine, minced garlic and bring to a boil. Place Clams in water, cover with lid and cook for 2-3 minutes. Then add mussels and cook for an additional 2-3 minutes. You know when they are cooked when they open their shells. Remove from liquid to a side plate. Then add shrimp and lobster tails to the liquid and cook for 3-5 minutes until shellfish is opaque (turns white instead of clear). Turn at least once while it is cooking. Remove shellfish to same side plate. Drain liquid and place shellfish back into saute pan and cover to keep warm. Once pasta is done cooking, strain pasta into a colander. Place the stockpot back on the burner and put Ragu Pasta sauce into the pan. Heat until sauce is warmed throughout. Toss Pasta back into the stockpot and mix the sauce and pasta until evenly combined. Add shellfish to pasta mix and warm for 2-3 minutes. Either serve direct from the pan to a plate or swirl fork size portions into small containers topping each with several pieces of shellfish in each container. Calorie/ Serving info was calculated as serving this as a main course, for 4 portions. This came in so handy for last minute out of town visitors… It’s going to be my little secret that I used a store bought sauce! No one was the wiser! They were all too impressed with the amazing shellfish I got! A lovely meal idea for a quick company dinner! Exactly! The sauce works so well it doesn’t need a lot added to it, and the shellfish impresses AND tastes good! This is literally the cutest seafood and pasta dish I’ve ever seen! Great idea! 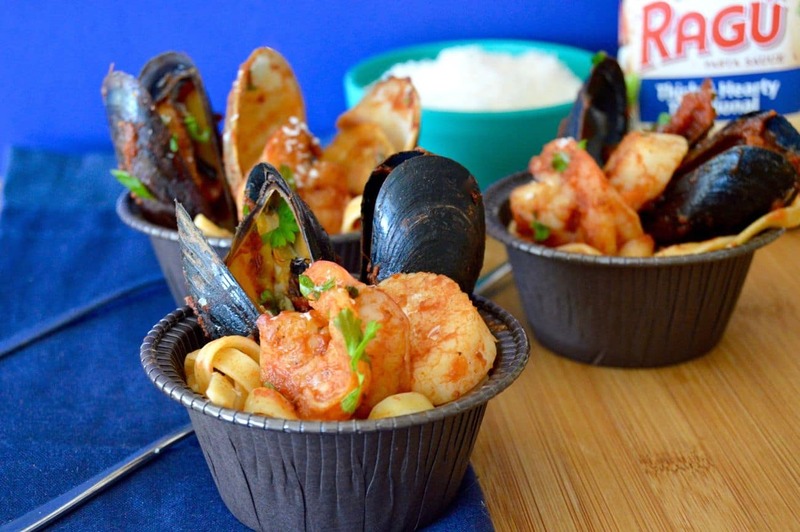 I LOVE all the seafood in this dish! My mouth is watering it looks so delicious! Oh my goodness!!! I REALLLLLY wish I had a BIG bowl of this right NOW!!!! Pinned! I love this sauce and your recipe looks so good! I want to come to your party and eat that seafood! YUM! And I’ll have to check out that Ragu- I’m always on the hunt for a better jarred sauce. So few ingredients for such a hearty meal! I’ve been hearing so many good things about Ragu lately. I’ve been passing them by, but the next time, I’m gonna pick up a bottle! That dish looks phenomenal! Great recipe.